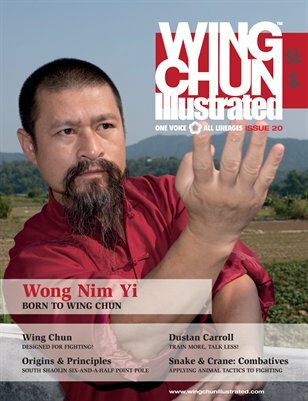 Issue 20 of WCI features Sifu Wong Nim Yi on the cover. Being the oldest son of the late Wing Chun Master Wong Wu Wong (nicknamed “Mai Gei Wong”), Sifu Wong Nim Yi was born into martial arts. He started learning from his father at a very young age and later trained in some other styles of martial arts to complement his Wing Chun. He has been actively promoting the art of Wing Chun in his native Guangdong Province for many years. In his younger days, he represented Wing Chun in various fighting competitions, but nowadays, he focuses on passing on his knowledge and skills to his students and promoting Mai Gei Wong Wing Chun Kuen. For a complete table of contents, please visit our website.